For families on the go and those that do a lot of towing, the 2016 Toyota Sequoia showcases a multitalented SUV. This massive vehicle has seating for up to eight passengers and the ability to haul up to 7,400-pound trailer capacity. Additionally, this SUV adds a long list of features for comfort and versatility, including an upgraded Entune Multimedia System. The 2016 model includes the high-tech connectivity and the latest safety features. A dynamic body-on-frame platform allows for the 2016 Toyota Sequoia’s quiet and smooth ride. Its four-wheel independent suspension delivers excellent shock absorption on the road and remarkable wheel articulation off the road. 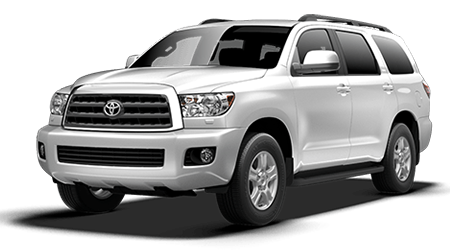 See the Toyota Sequoia and take it for a test drive here at Lipton Toyota in Fort Lauderdale, FL. Our outstanding and passionate sales staff is standing by and ready to assist our neighbors in Dade County and Broward County, FL. Like a relaxing retreat on wheels, the Toyota Sequoia is a serene and cozy place for a family to connect while on the highway. Its body contours diminish wind strife, and the overall exterior qualities have been shaped to minimize wind sounds, which helps maintain the cabin quietness. Sprawling rear doors facilitate easy passenger entry and exit as well as child seat installation. By folding down the second and third-row seats, the Toyota Sequoia can accept up to 120.1 cubic feet of whatever items you need to carry – and up to 11 feet long. Extra-large bottle and cup holders outnumber passengers two to one, and the Platinum grade includes two more as well. The 40:20:40 divided second-row bench seat allows for an array of configurations, aided by the seat-sliding adjustment. The middle row bends flat down, and there’s a one-touch element to make it simple for people to enter the back row. Sumptuous second-row captain seats are available for a seven-seat cabin. The third-row seat, which is quite generous for adults, is split 60:40. The third row also folds down flat; a job made even more expedient by the existing power tilting and folding component. The rear lift gate includes electric sliding glass that can open independently, and the sizeable cargo area is prepared with easy to reach hooks for shopping bags. The 2016 Toyota Sequoia features three trims: the SR5, the Limited, and Platinum. Climbing to the next rung, the Sequoia Limited will include power rear lift-gate with sliding window, the efficiency with reclining 60:40 split third-row seats, power folding, front and rear parking sonar, and 20-inch alloy wheels. The 2016 Limited also includes more luxury with second and third-row retractable sunshades, 10-way adjustable power driver’s seat, Blind Spot Monitoring, heated front leather-trimmed seats, a leather-trimmed steering wheel, and memory outside mirrors. The 2016 Sequoia’s exclusive engine choice is the prominent iForce DOHC 5.7-liter V8 motor with 381 horsepower and 401 pounds-feet of torque. Dual Independent Variable Valve Timing with intelligence and Acoustic Control Induction System (ACIS) ensure plenty of force throughout the motor speed span. It’s teamed to a six-speed electronically regulated automated transmission and consumes regular-grade fuel. The 2016 Toyota Sequoia is a multipurpose full-size SUV that operates with ease both on and off the road. Towing veterans and freshmen alike will treasure the Trailer Sway Control system, which uses the Vehicle Stability Control to offset forces that can lead to trailer swing. With the four-wheel independent suspension and full-time four-wheel drive, this quality system guarantees a ride that’s positively luxurious. And, the sprawling interior and adult-size room for third-row seating, makes on-the-road vacations something to enjoy again. You’ll get a great deal and superior customer service when you purchase a 2016 Toyota Sequoia at Lipton Toyota located at 1700 West Oakland Park Blvd. in Fort Lauderdale, FL. Be one of the first in Dade County or Broward County, FL to park this handsome family-friendly SUV in the driveway!